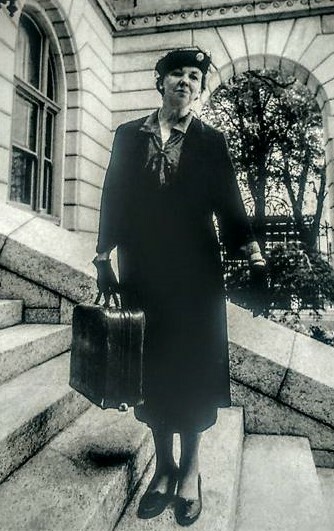 The title of the play is drawn from a statement made by Eleanor Roosevelt, summing up her life: "Everything I ever did was always accomplished across a barrier of fear." The play follows Eleanor from lonely, neglected childhood to the world stage. We meet her as a child ignored by glamorous, self-absorbed parents, then orphaned at 10 and so withdrawn she was unable to speak in the presence of others. We see her find herself when she has the good fortune to come under the tutelage of a progressive headmistress at a girls' finishing school. We trace her growing awareness of the world, as she sees beyond the aristocratic society into which she was born, doing charity work that opened her eyes to sweatshops and child labor and launched her into a lifetime of public service. Through her eyes, we witness the political rise of Franklin D. Roosevelt, whom she marries at 20 and for whom she bears six children. In her words we experience the trauma of Franklin's crippling polio, and her struggle along with trusted advisor Louis Howe, who became her political mentor, to nurse Franklin back to health and enable him to continue his ascent to power from his wheelchair. With her husband in the White House, we follow her as she completely reinvents the role of First Lady, becoming her husband's eyes and ears, going on fact-finding tours on his behalf and evolving into full political partnership, despite romantic heartbreak and lack of intimacy. We become her confidants as she reveals the woman beneath the liberal icon and crusader for human rights, reviled by reactionaries but a beacon of hope to working people and minorities. And finally we watch as she overcomes the death of her husband and partner to head the U.N.'s Human Rights Commission and lead the crafting of the Universal Declaration of Human Rights. Throughout the play we see how she learned to articulate her values and vision, how she kept moving forward in spite of disappointments and defeat, and how she built up her courage while facing daily "a barrier of fear." Following the performance, actress Jane VanBoskirk will invite the audience to ask questions and share personal memories or perceptions about Eleanor Roosevelt in a "Talk Back." Many audience members have personal memories of this woman who was a prominent figure in American life for much of the 20th century, some of them quite dramatic. To others, she is a page from a history book or an image from a documentary. The Roosevelts still stir up passionate argument to this day, but few are untouched by or indifferent to their legacy.